State Rep. Pat Boyd speaks at the Jan. 23 small business and manufacturing policy meeting. 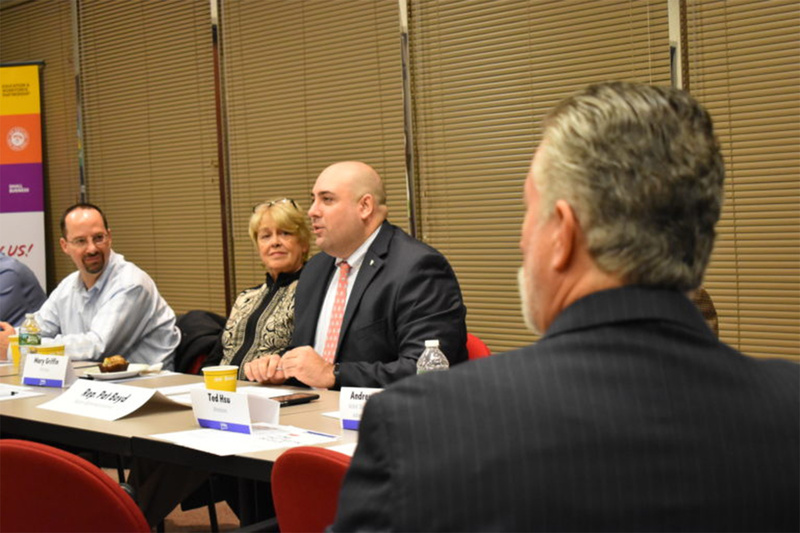 Workforce development, transportation, and Connecticut's fiscal challenges were among the top policy issues members of two influential CBIA councils discussed with state lawmakers Jan. 23. Rep. Pat Boyd (D-Pomfret), Sen. Paul Doyle (D-Wethersfield), and Rep. Pam Staneski (R-Milford) met with CBIA's Small Business Advisory Council and Manufacturing Advisory Council for a two-hour brainstorming session in Hartford. Michael Brault of Bristol-based Ultimate Companies told lawmakers the state must do more to promote manufacturing as a viable career option. "We are suffering from a narrative that says manufacturing is not a good career choice," Brault said. "At this point in time, that argument is patently false. "I think we need some sort of marketing campaign, some effort on the state level, to change that narrative. "Look at what's going on at Electric Boat and the contracts they have. Look at the aerospace industry. "There's manufacturing across the state, and there is a tremendous grassroots effort to try to promote technical education to give people opportunity. "But that narrative is having trouble getting momentum, especially among the higher levels of education. We've got to change the minds of the parents." Read the entire CBIA article.